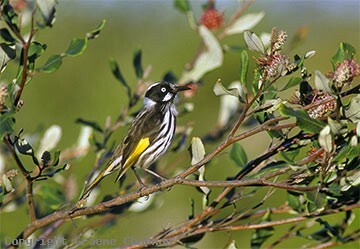 New Holland Honeyeaters are one of the most common and widespread honeyeaters to inhabit coastal and sub-coastal heathlands and shrublands in south-eastern and south-western Australia and Tasmania. As a consequence they are also one of the most well-studied of all our honeyeaters and their life history and general biology is very well documented in HANZAB - the entry takes up several pages. 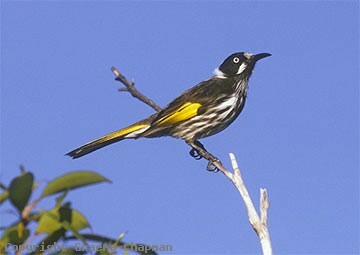 New Holland Honeyeaters normally breed as simple pairs, in favourable seasons sometimes in small, loose colonies where nests may be less than 30 metres apart. Males indulge in short vertical song-flights to advertise their territories while the females incubate the eggs, but both parents feed the nestlings, with nectar in the first instance and subsequently with insects. New Holland Honeyeaters are essentially sedentary and breed in the same places year after year, but in the non-breeding season they may wander a few kilometres in search of food, often in the company of the closely related White-cheeked Honeyeater. At this time, rather than flocks, they form small groups of 20 or so. On the east coast, the flowering of the various banksias is an important resource of nectar for these birds. 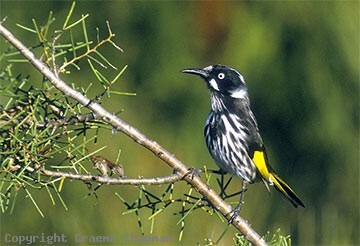 631201 ... New Holland Honeyeater. 631202 ... 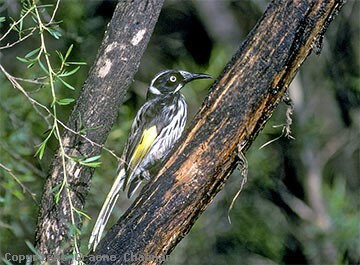 Feeding in Grevillea barklyana. 631204 ... Feeding on sap exuding from Agonis juniperina.